Polymers are arguably the most important set of materials in common use. The increasing adoption of both combinatorial as well as high-throughput approaches, coupled with an increasing amount of interdisciplinarity, has wrought tremendous change in the field of polymer science. Yet the informatics tools required to support and further enhance these changes are almost completely absent. In the first part of the chapter, a critical analysis of the challenges facing modern polymer informatics is provided. It is argued, that most of the problems facing the field today are rooted in the current scholarly communication process and the way in which chemists and polymer scientists handle and publish data. 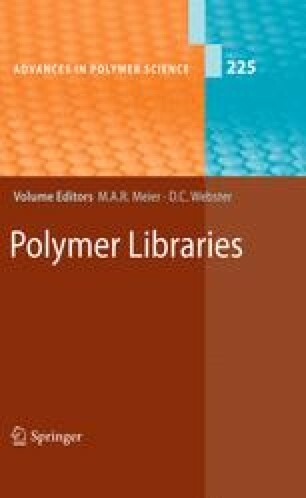 Furthermore, the chapter reviews existing modes of representing and communicating polymer information and discusses the impact, which the emergence of semantic technologies will have on the way in which scientific and polymer data is published and transmitted. In the second part, a review of the use of informatics tools for the prediction of polymer properties and in silico design of polymers is offered.